We ran out of Disneyland and headed toward California Adventure. There were a bunch of spectators there and lots of them had signs! One of my favorites said “This is the worst Disneyland parade ever. Your choreography is awful”. But the absolute best signs said “May the force be with you” or “The force is strong with you”. Now, I'm not the worlds biggest Star Wars expert, but I do know that when they refer to the force, they are basically referring to God. Every time I saw one of those signs, I read it as “May the Lord me with you” or “The Lord is strong with you”. Talk about your tender mercies. I could definitely feel all of the prayers of my family and friends, but as if that wasn't strong enough, there were signs EVERYWHERE confirming to me that the Lord was watching out for me and helping me run the race! As I ran into the park, I got a text from my dad that said “Welcome to California Adventure”! He had been tracking me with an app that we use and it made me feel so good to know that they were keeping track of me!! It was also at that point that I started to feel pretty dang good about my pace! I had done very little walking and I felt like I was keeping up with the crowd! That gave me the confidence to stop and take a few pictures, and I'm so glad I did!! Not too long after these pictures, my costume started falling apart. Let me just first clarify that I was supposed to be Jedi Princess Aurora (can't you tell my the crown), but for some reason, people kept calling me Princess Peach. 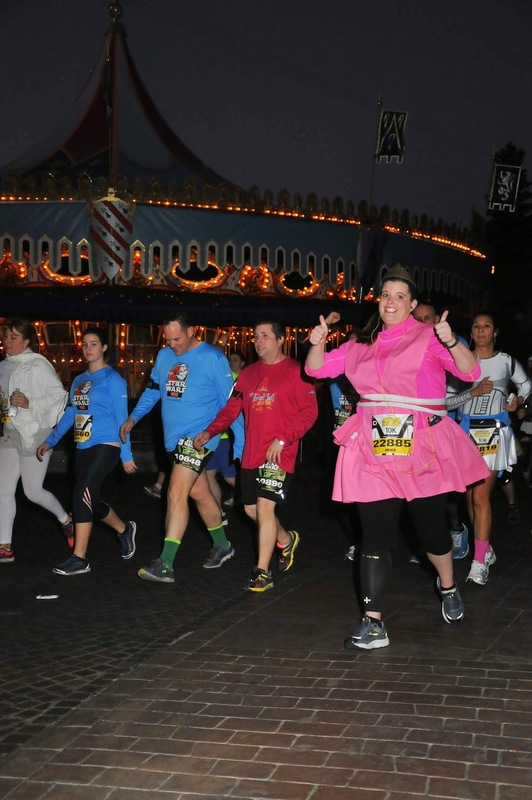 Who the heck shows up to a Disney race dressed as a Nintendo character?!?! Come of people!!! Any way, I had used a lot of double sided tape to try and keep my costume together, but by mile five, it no longer wanted to stick. The fabric over my shoulders kept falling off and getting in my way! 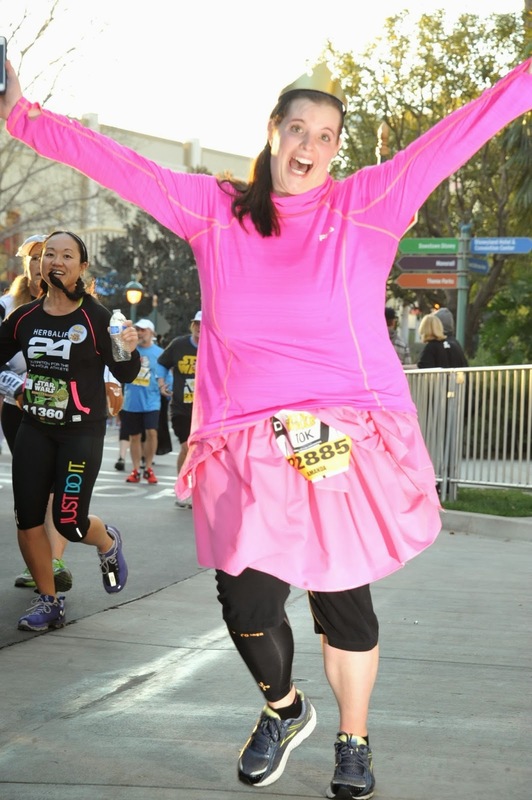 So I ended up trying to run, while unpinning my race bib, taking off the fabric, and then pinning my race bib back on! Talk about multi-tasking!! Just as I came up to the Paradise Pier hotel, the sun really started to come out! It was so pretty, but I was also grateful that it had stayed down for most of the race, keeping the air cool!! I also got a chance to take a picture with the six mile marker! At that point, I could heard the finish line! I decided to FaceTime my family because I wanted them to cross the finish line with me! They had done so much to get me to that point and I never would have made it without their love, encouragement, support and prayers!! I talked to them for a few minutes and then it was time to get my medal!! SUCH a good feeling!! Not long after that, Miranda crossed the finish line! I gave her a big hug and was so proud of her for finishing on her own!! We had made it! We had survived!! We crossed the finish line on our own two feet.... no pacing cart required!! Best of all.......the “force” was with me every single step of the way. Race morning started bright and early. Well, I guess I shouldn't say bright, because it was 3:40 a.m and the run was definitely not up! As I started getting ready, I was trying to force myself to eat goldfish crackers, but my nerves had started again, so I only had a handful! Before we walked out the door, I told my friend Miranda that we needed to pray. One of the things my dad told me in my blessing was to make sure I prayed before and after the race! We stood there together in our hotel room, while I said a quick prayer that we would both be safe and that we could make it through the race. Once we said amen, it was time to head out and we left our room around 4:30 a.m.
Luckily, our hotel was really close to the starting line, so we were just able to walk over. It was nice to kind of start warming up and the feel the energy of the other runners walking with us! My race bib said I was supposed to be in corral “D” and Miranda's said she was in corral “E”. There weren't very many people standing in corral “E” and I felt bad telling her to go stand back there by herself for more than an hour, so I told her to just stay with me. Plus, I didn't necessarily want to be alone either! The race began at 5:30 a.m. but we had to wait awhile to start since we were one of the last corrals. I did some stretching to keep my muscles warm and we chatted with some of the runners around us. Finally it was our turn! As we got closer, we could hear the announcer, who was with C3-PO and R2-D2, cheering everyone on! We could also hear the Star Wars music playing! Our corral got up to the start line, they counted us down, and we took off. The big screen overhead said “May the force be with you” and then told us all to run!! Miranda and I walked the first three-quarters of a mile together. We were right in the middle of the pack so it was kind of hard to run. Once I made it to Harbor Boulevard, I decided I was ready to run! Miranda and I wished each other good luck and I took off!! It felt so good to run! I felt happy to be running!! I felt much better running than I'd felt in months!!! I knew my dad's blessing was helping me and I knew the prayers of my family and friends were giving me strength! The “force” was definitely with me! 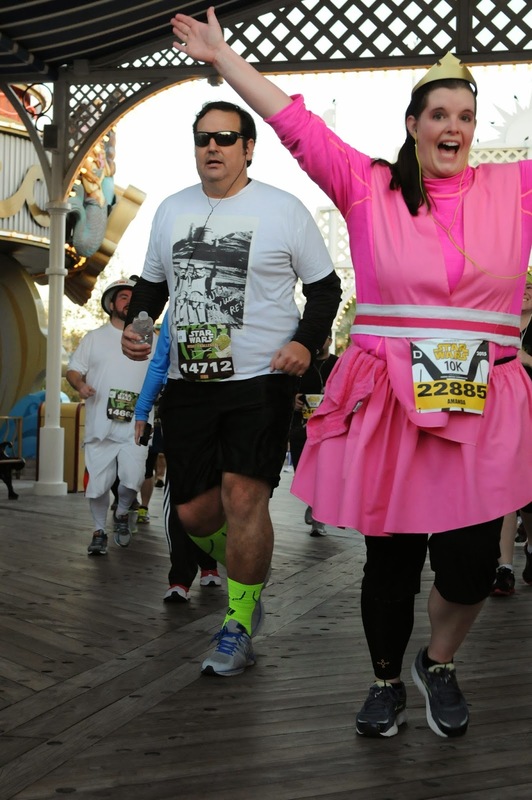 As I ran toward the gates of Disneyland, I thought back to my first Disney race. During that race, my dad was waiting for me right before I went into the park, cheering me on. 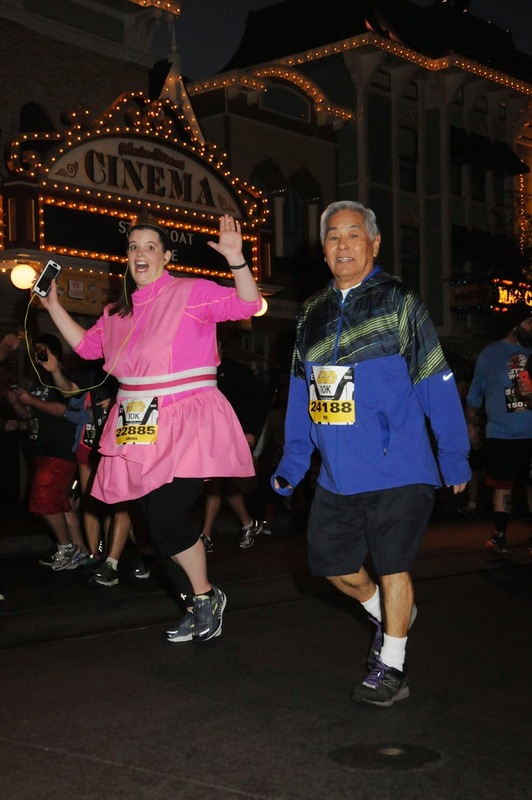 I imagined him standing there, cheering me on, and that gave me a boost of energy as I ran down Main Street! The course took us into Frontierland and I saw a huge line of people just standing around. At first, I didn't know if they were all runners and I couldn't figure out why there were all just standing around. As I got close to the Rivers of America, I could see Chewbacca standing there taking pictures with runners. long lines because I needed to be careful of my time! I was hoping that since I was toward the end of the pack, that most of the runners would be through by the time I made it to the characters. I was wrong! Really wrong! As I ran into Tomorrowland, I could see a huge line and there was no doubt in my mind what they were waiting for! As I ran around the corner, there was Darth Vader standing in front of the Innovations building! There were even Storm Troopers walking around! I debated for a few minutes whether I should stand in line or not..... but the line was at least a 20 minutes long and I knew I couldn't afford to lose that much time! From Tomorrowland, we ran back toward It's A Small World. There were a couple of Jedis standing there, cheering us on, and they didn't have any lines. So, I stopped for a quick selfie!! We made our way through the backlot, which is one of my favorite parts! A lot of the employees come out to cheer and give high fives! It's so cool to see them all there, so early in the morning, giving up there time, to help make the race fun! They were also working on Splash Mountain while we were there, so all of the logs were sitting out and that was kind of cool to see! 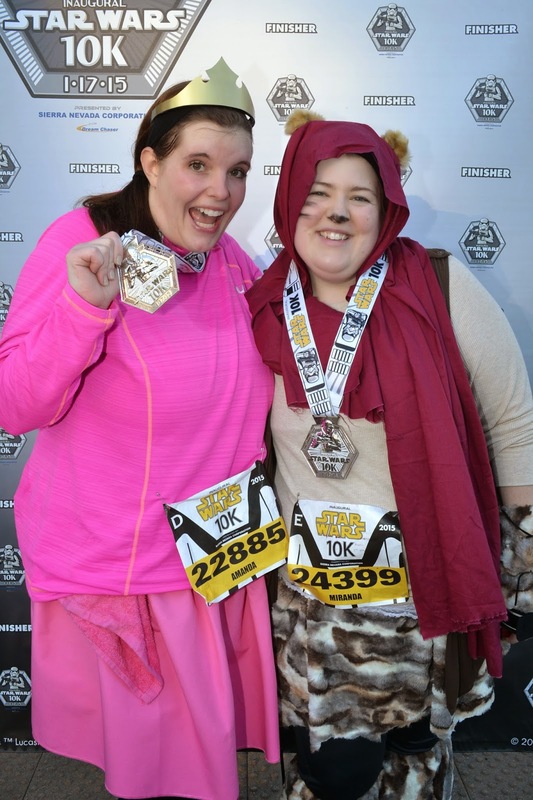 In the summer of 2014 I signed up to run the inaugural Disneyland Star Wars 10k. They always make you sign up for those races months in advance, so I had until January 17, 2015 to train. I told myself I had plenty of time and, since I had done a 10k before, I was going to be just fine! Not long after I signed up, I ran my first Ragnar race. I was wiped out by the time that weekend was over and I told myself I deserved a break from running.... a week at least! Well, a week turned into two.... and two weeks turned into a month! At that point, it was the middle of summer and it was hot.... really hot!! I told myself every night after work that it was way to hot and there was no way I could run outside! I told myself that if I waited until September, I would still have plenty of time to prepare. Before I knew it, it was October. It had been three and a half months since my last run, or any other kind of workout for that matter! Not only that, but winter was coming and my running outside days were going to be numbered. I, of course, started to get a little stressed about how the race was going to go. I went for my first run annnnnd......... It didn't go well. I don't remember how far I made it before I gave up, but I would say it was probably less than a mile. My next few runs were not much better. One of my biggest obstacles was my weight. I had gained quite a bit over the summer and I could definitely feel it! My calves ached every single time I went out! And I felt like I was losing circulation in my feet. It was rough. I told myself over and over I hated running. I had to force myself to go out each night and I was miserable the whole entire time. I would get discouraged after every short run and would be overwhelmed with frustration when I got home. I had lost all motivation to be a runner! It got so bad, that I considered just not showing up for the race at all..... I knew I'd be throwing over $100 down the drain, but I told myself it would be better to not show up at all than to be humiliated by not finishing the race! Daylight savings came, so my evening runs were now in the dark. There were nights when it was freezing....when I couldn't feel my nose, fingers or ears! But, I told myself that was the price I had to pay for slacking off in the summer! Believe it or not, running actually got slightly easier on those cold dark nights! It was sort of peaceful to be out alone in the chilly air. I still couldn't run a mile without stopping, but I would usually run miles two and three without a break, so that was progress! I was also extremely blessed because we had an insanely mild winter. My plan had been to run outside as long as possible, and once the snow started flying, I was going to hit the treadmill. I wasn't excited about treadmill running, only because, for me, I don't feel like I get the same kind of workout. I feel like I can go faster and further on the treadmill, which definitely doesn't help when it comes time to run on the pavement! My last resort was going to the the rec center track. Track running is super hard for me..... I get bored looking at the same walls for 30+ laps!! But like I said, I was blessed with dry roads and was able to run outside until the week of Christmas. We got our first snow storm on Christmas day, so for the next few weeks, I went to the gym. Sometimes I'd use the treadmill, but I mostly worked out on the elliptical machine. I felt pretty bad about it.... because I was worried that I wasn't getting the kind of workout I needed. But, I figured it was better than nothing. January came and my nerves set it. I knew I wasn't where I needed to be, especially since my longest outdoor run had been 3.60 miles! And as if that wasn't bad enough, my pace was very very slow! 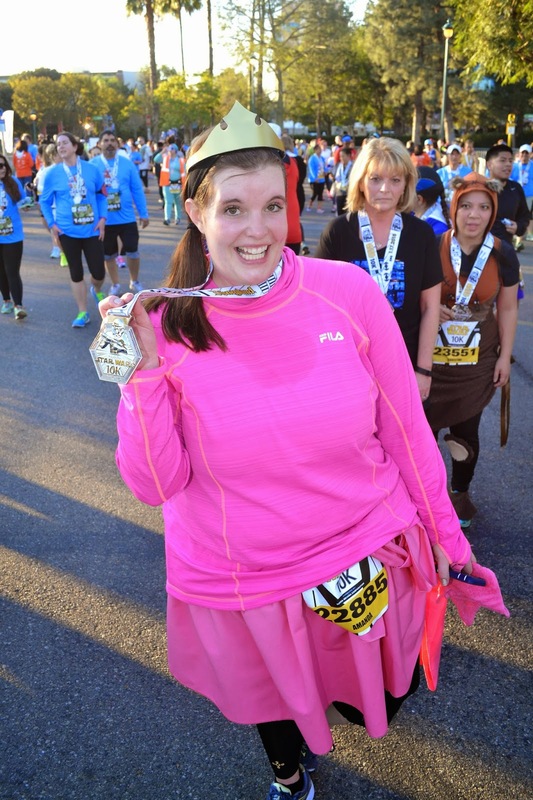 All of my self-doubt came back and I again considered just skipping the race! The night before I left for California, I was a mess. All I could think about was being picked up by the pacing cart. 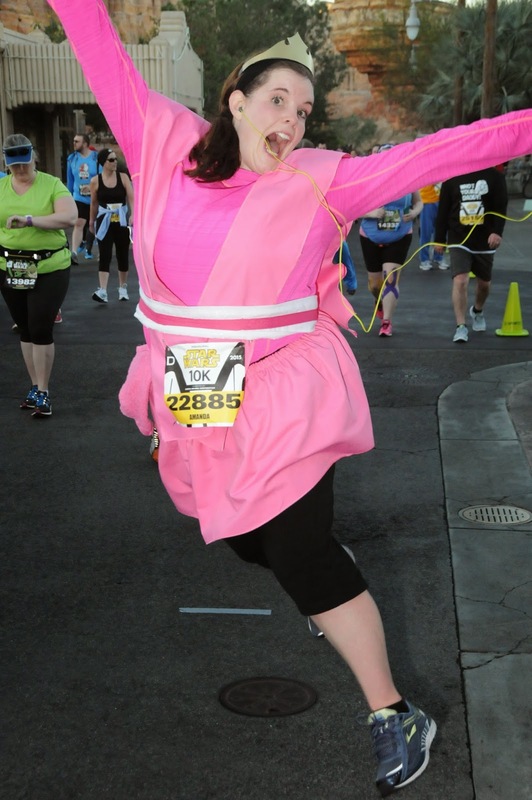 I did not want to be the fat girl who couldn't make it through the race and had to be driven to the finish line. I needed all of the help I could get at that point and asked my dad if he would give me a blessing. In my head, I was thinking “I need him to bless me that I'll be able to run faster and farther that I've been able to in the past few weeks”. My dad is amazing and he knew exactly what to say! He didn't say the exact phrase I was hoping for, but what he said helped me feel peace, and really, what's better than that! Once my friend Miranda and I made it to California, we went to the Health and Fitness Expo at the Disneyland hotel to pick up our race packet! That was the moment I finally started to get excited about the race! There is just something that pumps you up about holding your race bib and tech shirt! We walked around the expo for awhile, checking out the vendors and buying some cool stuff. We didn't stay too long though because we wanted to go over to Disneyland! We rode a couple of rides and did some shopping. But we also made sure we had time to carbo-load and we ended up at Pizza Port for some delicious pasta and bread sticks. We didn't stay very late, because we knew we had to get up really early for race day! to get a lightsaber to go along with my costume! They had basic ones.... that cost $12! Or you could build your own sweet lightsaber.... that started at $20. I wanted a blue lightsaber SO bad! Back at the hotel, we set out our running gear and laid out our costumes. We set the alarm for 3:40 a.m. and we were in bed by 9:30 p.m! 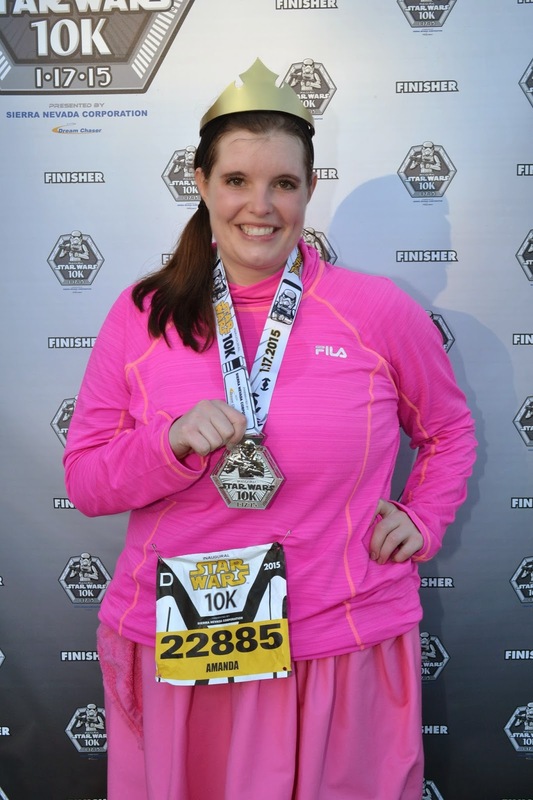 In April 2014, one of my co-workers, Ali, asked if I'd be interested in joining her Ragnar team! I was pretty surprised that she asked me, because I'm not a fast runner at all!! But I was psyched for the opportunity! At that point, there was only about two and half months until the race. Luckily, I was runner seven, which meant I had the easiest legs! My longest leg was less than five miles, so I figured I'd be okay! I kept to my normal running schedule, with a goal to be up to five miles at least two weeks before the race. The thing is though, it's hard to really train for a Ragnar race until you've actually done it! I had no way of knowing what it would be like to run my legs, since I had never done it before. About six weeks before the race, I decided to get some new running shoes. I went with Altras because I have heard good things about "barefoot" and "zero drop" running. But after about two weeks of bad runs, I decided they weren't for me and switched them out for a pair of Brooks. I was nervous at that point because I had lost two weeks of training. And I didn't dare try to break in a new pair of shoes, so I stuck with my old ones. Finally, only a few days before the race, I ran five miles non-stop! I was so excited that I kneeled right down on the grass and thanked the Lord for helping me reach my goal! Race day came and I was super nervous! I was worried about letting my team down and being too slow! I was worried about the exchange points and recognizing the guys I was supposed to take the baton from! And I was worried about running at night! I met up with my half of the team, van two, and we drove to Eden, Utah for the first exchange. I had never been to Eden before, but it is a beautiful place! The drive up was super rainy and I was worried about running in a downpour, but when we got to the exchange point, the rain stopped and the sun started to come out. Finally, it was time for us to make our way of to the exchange point! I stood in the corral and watched as my teammate ran toward me with the baton (a sweet orange slap bracelet). We made the exchange and I took off! I had my phone with me and had planned to use Pandora for my music. Well, I wasn't really thinking about the fact that I was going to be in the middle of nowhere, going through mountain ranges, so I didn't have an internet connection. I started to panic! How in the world was I going to run four miles with absolutely no music! I started out trying to sing songs in my head... but that didn't last very long! I had the thought to check my iTunes app, and thankfully, somehow, about five songs had made it on to my phone! I listened to the same five songs, over and over, for pretty much all three legs! What a huge blessing it was to have them on my phone though!! Let just say, every time I hear the Neon Tree sing "Everybody Talks" I will always think of Ragnar!! I was about halfway through my run, going through "downtown" Eden, when I spotted my mom and my grandparents standing on the side of the road cheering me on!! How awesome that they made the drive all the way up there to support me!! As I came up to to exchange point, I was greeted by my team. They had met up with the other van and picked up our huge pirate flag! Our team name was "Haulin' Booty", so it was very fitting! My mom and grandparents had also made their way to the exchange point, so I got to give them all a hug before connecting with my team! Once my first leg was over, I got a twelve hour break! I drank a ridiculous amount of water in a really short time and then cheered the rest of my teammates on! Our first major exchange was at the Snowbasin resort (which is beautiful, by the way). Runner eleven was out, so we parked and decided to grab a couple things to snack on. Unfortunately, I started to feel sick. I think I had drank too much water, way to fast! I made my first (yes first) stop at the first-aid tent! Thank goodness for those people!! After our last two runners were done, we drove to the next major exchange point, a high school in Morgan, to clean up and take a break!! It was about 7:00 p.m. so we had to break out our reflective gear and wear it anytime we were outside! The school had a nice big field so we were able to take our pillows and blankets and spread out. I had brought a sleeping bag with me, but I didn't want to worry about rolling it back up later, so I just took a blanket with me. Mistake! It got pretty chilly and I wished, more than once, that I would have just brought the sleeping bag with me! I was, however, smart enough to grab my sleep mask and ear plugs!! After a few hours of laying around (no real sleep on my part), we loaded back in the car and headed to the exchange point. As we got closer, traffic got really really bad! We kept watching the time and trying to contact van one to find out what time runner six had started his leg! I was getting really worried that I was going to have to get out a run with runner six to the exchange point and then keep going on my leg!! Thankfully, we beat him there!! I grabbed the slap bracelet from him and took off on my night run, reflective vest, head lamp, tail light and all!! My leg started off with a pretty big hill.... I was going up and over part of a mountain. Sadly, I had to do a lot of walking up that dang hill!! When I finally made it to the top, I was rewarded with a nice long downhill!! I had been so worried about my night run, but I actually really loved it! It was pretty peaceful running in the dark! I was in the middle of the mountains, so I got to see all of the millions of stars that you don't normally see in the valley! Plus, the air was nice and cool, which always helps! Unfortunately, after my downhill, it was nothing but up..... and more up! Steep up!! There were more than a few times I wanted to sit down on the side of the road and take a break!! Thank goodness for kind fellow runners who would jog by, saying nice and encouraging things!! I was SO happy by the time I saw the exchange point! I was definitely ready to be done with the hills!! I was actually pretty lucky because my night run started at about 11:30 p.m.! I would much rather start then than at 4:00 a.m.!! My plan was to finish my night run and then sleep for a few hours in the car. No such luck! It was hard to get comfortable, and it got really cold... plus, we were constantly letting runners in and out of the car. Finally, I ended up the back of the Suburban and was able to sleep for about an hour! After all of our night runs, we went to the rest point at a high school in Summit county. This school was awesome because you could use their bathrooms and showers for free!! It was SO fantastic to use a flushing toilet after 24 hours of using a Honey Bucket!! We tried to sleep a little more, but I still wasn't feeling that great, so I mostly just sat around and relaxed. It was also the second time I visited the first-aid tent. This time it was for my feet because I was starting to get some blisters. Again, I was grateful, this time for the mole skin!! My last run started in the late afternoon on Saturday. It was going to be a pretty flat run and was less than five miles, so I was pretty sure I had it in the bag. Boy was I wrong! This is the part that's hard to explain if you haven't run Ragnar! You think you're feeling great..... but you realize that the last day and a half have caught up with you! The fact that you haven't slept much kicks in and energy is running low! I started off okay.... but pretty quickly had to start walking. This was a big disappointment to me!! But my spirits were quickly lifted when all the sudden two cars drove by, honking and cheering for me! My parents and my grandparents drove up to help me along the course!! I was SO happy to see them! They brought me water, my mom walked some of the course with me and they cheered me on! I LOVED having them there!! At one point, I was running through a neighborhood and a little girl was standing on the side of the road with a hose. As I got closer she asked "Would you like me to spray you"? It was SO hot at that point so I gladly welcomed it!! Not far down the road was another group standing on the road doing the same thing!! I thought it was so cool that bystanders along the course got involved! After what felt like and eternity, I finally saw this sign!! And I was even more grateful to cross my final finish line! My team was there cheering me on, but so was my family!!! It was THE best moment!!! After that I got to enjoy the rest of my time in the Suburban, cheering on my teammates! They were all rock stars, especially Aliza and Ali, who conquered Ragnar hill!! Along the way, I visited the first aid tent for the third and final time!! I had some pretty ridiculous blisters on both feet. At that point, they were pretty bad and there wasn't much they could do! They wrapped them a little, but I had to hobble around for the rest of the day!! The finish line was in Park City. We got there pretty early so we had time to meet up with the other half of our team! We waited at the finish line together as runner twelve finished his leg. As he came to the end of the course, we joined him and crossed the finish line together! It was so amazing!! Waiting for us were our medals! How cool are they!! We took some team pictures and congratulated each other on a great race!! My parents were also waiting for me at the finish line, and my mom had made a really cool Haulin' Booty pirate flag for me! Their support meant so much to me!! On the way home, we stopped so I could get my first real meal in 24 hours..... a Wendy's hamburger and a Dr. Pepper! Delicious!! We got home around 10:00 p.m. and I ended up sleeping until 1:00 p.m. the next bed!! I was super excited to wake up to a Village Baker lemon bar from Kaylee!! The next Monday, Ali asked me if I was ready to sign up for Ragnar 2015! At first, I wasn't sure if I wanted to do it again!! It was a pretty crazy experience!! But after a few days, I finally committed!! I'm determined to fully run all three of my legs this year! And not to get sick!! Andrew. Shiloh. Anne. Dallas. Walter. This girl has been busy!!! "I don't own emotion...I rent..."
I want to change my hair and need your opinion! BAKE OFF BATTLES!! MAY THE BEST CUPCAKE, CAKE, & OR SOUFFLE' WIN! Do you have a fun memory of you and me?? Remind me of it by clicking on the link below! !